Meet the former Williams F1 test driver at MT's Inspiring Women Edinburgh conference. What advice would you give to a woman starting out in the motorsport industry? Initially it is about earning the respect of your team or colleagues. Work hard, be dedicated, show your passion and focus on performance. Like most industries, motorsport is performance based so if you perform your gender is irrelevant. I think we need to push for women to get more opportunity to rise through the ranks, as Sheryl Sandberg would say, Lean In. This doesn't mean pushing women simply to meet quotas or diversity figures. This means driving female talent to make sure those who are capable get the opportunity to rise to the top and be recognised. What could be done to get more women into motor racing? I have started an initiative called Dare to be Different to get more women into motorsports. We believe in Driving Female Talent in order to take advantage of the opportunities which are out there. We aim to connect, showcase and inspire girls and women through our community. On top of this there will be 2 networking events and 5 headline events in which we get 8-12 year old to a kart track to experience the many different aspects of racing, from driving a kart to doing an engineering challenge to recording a piece to the Skysports camera. In sport there is always only ever one winner and there have been many very tough moments in my career in which I didn’t think it was going to be possible to achieve my goals and dreams. I simply refused to give up. I stayed strong mentally, learnt from the disappointment or failure and always refused to give up on my goals and dreams. 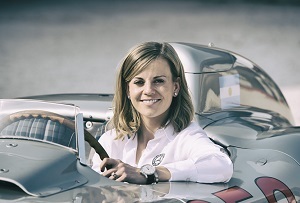 Hear more from Susie Wolff at MT's Inspiring Women conference in Edinburgh on 17 March (book below).